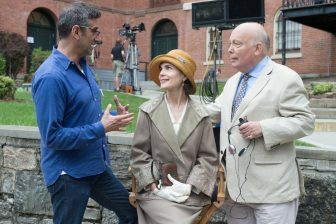 Julian Fellowes and actress Elizabeth McGovern have been reunited. The story follows Louise Brooks, the 1920s it girl, with her bobbed dark hair, heavy eyeliner and reckless ways. But before she was famous, she was 15 and needed a chaperone. McGovern plays Norma, a sedate woman from Wichita, Kansas, who watches over Louise, played by Haley Lu Richardson. As the duo makes their first trip from Kansas City to New York, Norma’s husband is less than enthusiastic about her travels. It’s ultimately Norma’s sons who urge her to embark on the journey across country. And that trip will change the lives of both Norma and Louise. “These two women [are] at very contrasting periods of their life,” Julian Fellowes tells Here & Now’s Robin Young. Louise is a young icon, who embodies the epitome of the changing culture in America. And Norma is an older woman who has “constructed this house of cards on which she’s based her life, which is this moral code that she’s inherited,” McGovern says. But she says Norma “discovers herself” during their adventure in New York. “I loved the idea that it was a story about a woman who is changing alongside a changing country, making discoveries about herself in late middle age, which is not a story that is told very much in the time,” McGovern says. Fellowes: “What I will reveal is that it’s really good. Emiko Tamagawa produced and edited this interview for broadcast with Tinku Ray. Serena McMahon adapted it for the web.